Bayer's Product Excellence Team, which is unique to Canada, consists of researchers dedicated to optimization – improving the yield and agronomic performance of InVigor canola. Growers should focus on the number of plants that survive the season through to harvest. The standard survivability rate for InVigor hybrid canola is 50 to 70 per cent, meaning growers should seed 10 seeds/ft² to achieve a target plant population of 5-7 plants/ft². However, dozens of conditions impacting their fields during the growing season can influence final plant counts at harvest. Growers can tweak the seeding rate based on these conditions the following year in order to achieve the target plant population. Seventy per cent of growers still determine optimal seeding rates by lbs/acre, but this results in a variable plant density, as the thousand seed weight (TSW) can vary across different hybrids, and even within a single hybrid. Instead, growers should seed based on target plant population. 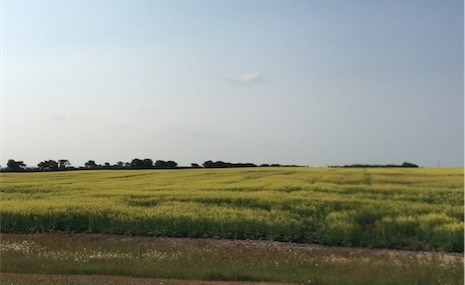 The importance of calibration is something already recognized for other row crops like corn, but the practice might be new for some canola growers. Growers should become familiar with both air drills and calibration, and adjust equipment according to the TSW of their canola. Seeding practices are lower on grower’s radar compared to things like fertilizer, seed variety, new equipment options and disease/weed management. This is a finding that doesn’t have a cost input, but can deliver a yield increase. Over or under seeding, a common issue when seeding by pounds per acre, has significant consequences to overall yield. The best way to control for variability is to seed a starting average of 10 plants/ft², for an ideal target plant population of 5-7 plants/ft².